Last week the lady and I were delighted to go along to a private viewing of renowned portrait photographer Andy Gotts's new exhibition in collaboration with BAFTA at Somerset House entitled Behind the Mask: Andy Gotts MBE portraits for BAFTA. River Phoenix's character is not only speaking of the uniqueness and individuality of faces as well as something much larger - how he relates to the world and his place in it. 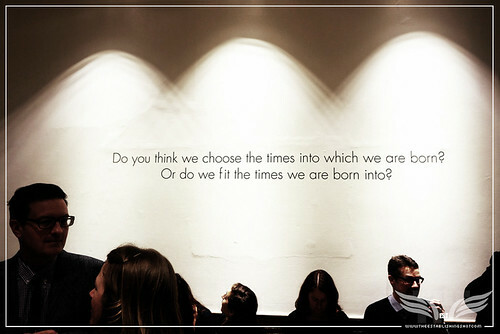 But also a very human trait that we have, the ability to project mood and emotion onto something. It takes talent to paint something with light bringing its inner personality and character to the fore or allowing previously hidden or surprising qualities to be revealed and allowing others to see the same thing. Some would argue that that is the goal of any artistic endeavour and this is something photographer Andy Gotts excels at. In my mind evoking mood, character, atmosphere, meaning or narrative with a still photograph is indelibly tied into the ideal that the composition of each scene or frame of motion picture says something. And for me is just as important as narrative, plot or performances. Andy Gotts is internationally recognised as the man able to capture the essence or personality behind the face he photographs and if you are familiar with any of my photography you may appreciate that I am a fan of Gotts's work. If you are an avid reader you may remember I mentioned Gotts in a post last year as some of his rousing work was on display at the Mount Street Gallery when I visited artist Tony Dykes's 007 Project Bond Exhibition. So you can probably guage my delight at cracking an invite to go along and see Andy Gotts's work up close. 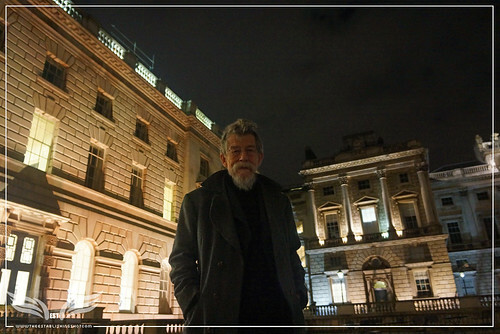 The Establishing Shot: JOHN HURT AT THE BEHIND THE MASK: ANDY GOTTS MBE PORTRAITS FOR BAFTA EXHIBITION AT SOMERSET HOUSE, a photo by Craig Grobler on Flickr. 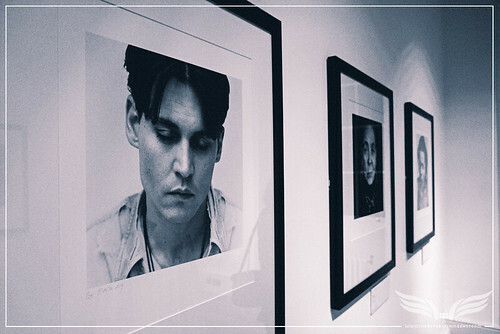 The British Academy of Film and Television Arts (BAFTA) has announced that its new photography exhibition, entitled ’Behind the Mask’, will exhibit at Somerset House, London from 20 January to 7 February 2014. The Establishing Shot: BEHIND THE MASK: ANDY GOTTS MBE PORTRAITS FOR BAFTA EXHIBITION AT SOMERSET HOUSE, a photo by Craig Grobler on Flickr. 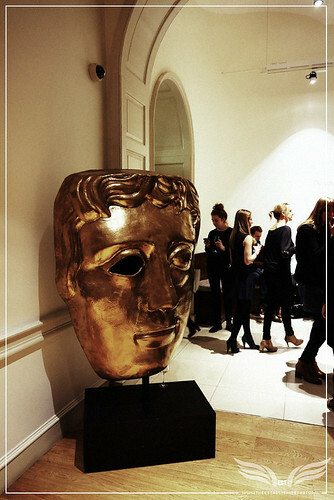 Some of the exhibit will then move to BAFTA 195 Piccadilly from 9 February up until 16 February, the date of the EE British Academy Film Awards, as well as Asprey London, venue of the Awards’ Official Nominees Party. The Establishing Shot: SOME OF MY FAVOURITE ANDY GOTTS PHOTOS - BEHIND THE MASK: ANDY GOTTS MBE PORTRAITS FOR BAFTA EXHIBITION AT SOMERSET HOUSE, a photo by Craig Grobler on Flickr. ‘Behind the Mask’ is a BAFTA Future Archive collaboration with renowned photographer Andy Gotts MBE, a celebrity photographer for 23 years specialising in actors’ portraits, who together have produced ‘Behind The Mask’, a photographic census of over one hundred international actors and actresses to have won or been nominated for a BAFTA since 1954. 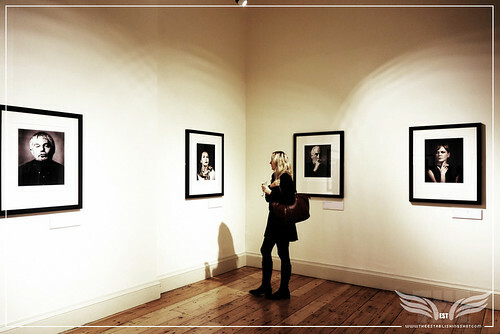 The Establishing Shot: SOMERSET HOUSE WEST WING GALLERIES - BEHIND THE MASK: ANDY GOTTS MBE PORTRAITS FOR BAFTA EXHIBITION AT SOMERSET HOUSE, a photo by Craig Grobler on Flickr. 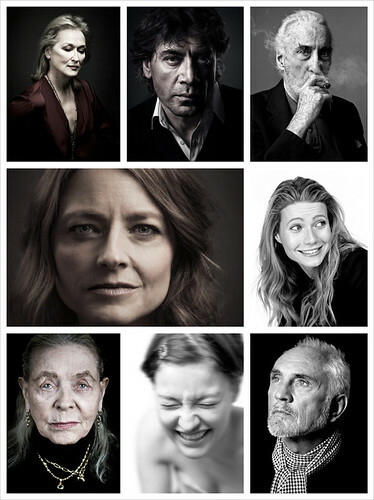 The project has been over two years in the making and seen Gotts travelling across the globe in order to photograph subjects including Lauren Bacall, Jeff Bridges, Daniel Day Lewis, Al Pacino, John Hurt, Sidney Poitier and Tilda Swinton. The third thing that struck me about Andy Gotts's the Behind The Mask Exhibition is how large it is, the exhibition has taken over almost the whole of the ground floor of the West Wing of Somerset House, just when you think it couldn't get any better you discover another room with more gorgeous photos. The Establishing Shot: @Silke_Schild's VIEWING THE BEHIND THE MASK: ANDY GOTTS MBE PORTRAITS FOR BAFTA EXHIBITION AT SOMERSET HOUSE, a photo by Craig Grobler on Flickr. 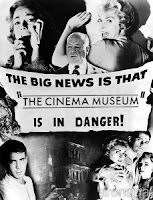 I had no idea about the breadth of his work and the Behind The Mask Exhibition focusses on BAFTA nominated talent only. In total there are more than a 100 photos on display and needless to say the breadth of Gotts's work of BAFTA nominated performers is extraordinary. 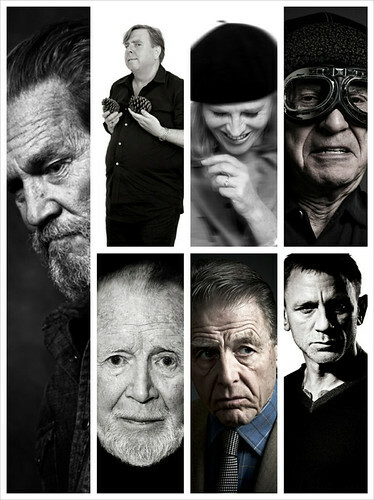 The Establishing Shot: MORE OF MY FAVOURITE ANDY GOTTS PHOTOS - BEHIND THE MASK: ANDY GOTTS MBE PORTRAITS FOR BAFTA EXHIBITION AT SOMERSET HOUSE, a photo by Craig Grobler on Flickr. His body of work on display reads like an Encyclopedia of talent - it is a veritable Who's Who of talent from the Twilight gen squeal inducing stars through to genuine masters of their craft with gravitas enough to cause small moons to orbit them. 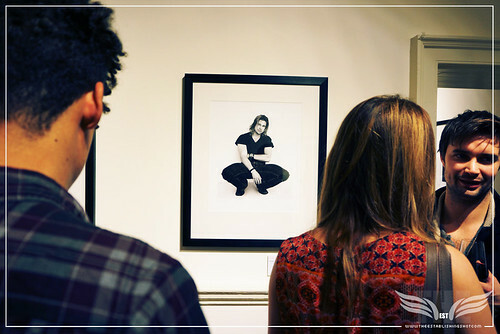 The Establishing Shot: @Silke_Schild's FAVOURITE ANY GOTTS PHOTO BRAD PITT - BEHIND THE MASK: ANDY GOTTS MBE PORTRAITS FOR BAFTA EXHIBITION AT SOMERSET HOUSE, a photo by Craig Grobler on Flickr. The second thing that I was struck by was how glamorous the evening was the amount of support Andy Gotts has from stars themselves as well as art lovers which speaks volumes about his personality. When we met him he was charming, gracious and generous with his time. 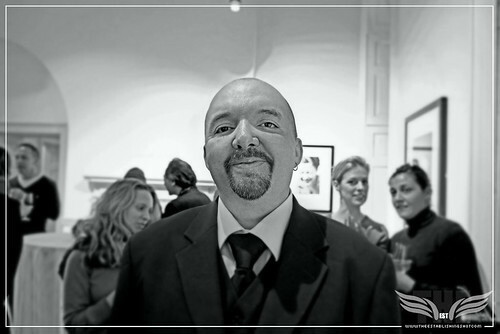 The Establishing Shot: MR. ANDY GOTTS MBE - BEHIND THE MASK: ANDY GOTTS MBE PORTRAITS FOR BAFTA EXHIBITION AT SOMERSET HOUSE, a photo by Craig Grobler on Flickr. I mention this as there were many notable people waiting to chat with the man yet he took time to chat and even posed for a cheeky snapshot. If you are going to get photobombed this is the guy to get photobombed by! You can see some more of the evening on Gotts's Twitter feed or Facebook page. The Establishing Shot: ANDY GOTTS PHOTOBOMB AT HIS FAVOURITE PHOTO IN THE ROOM - BEHIND THE MASK: ANDY GOTTS MBE PORTRAITS FOR BAFTA EXHIBITION AT SOMERSET HOUSE, a photo by Craig Grobler on Flickr. There are many favourite photos to choose from but some of my favourite photos from the evening included photos of Hugh Jackman, Sarah Miles and Kelly Macdonald in which Gotts' uses a stunning technique that makes the subjects pop out the print with an almost 3D effect. 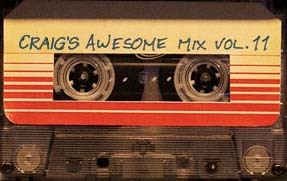 I had to do a double take with the Jackman one to see that it wasn't some sort of lenticular format. But my favourite photo has to be a toss up between the absolutely gorgeous photo of Charlize Theron (obvs.) capturing her glamorous star quality, the striking photo of Tilda Swinton capturing her etherealness which was almost hidden behind additional coat racks brought out on the evening and an unbelievable shot of Jeff Bridges full of his earthy ruggedness, reminiscent of his "True Grit" look and captures a moment of reflection. 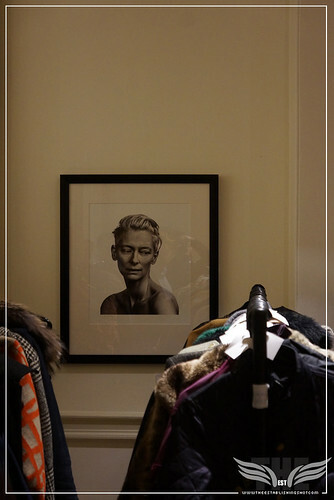 The Establishing Shot: STRIKING TILDA SWINTON - BEHIND THE MASK: ANDY GOTTS MBE PORTRAITS FOR BAFTA EXHIBITION AT SOMERSET HOUSE, a photo by Craig Grobler on Flickr. 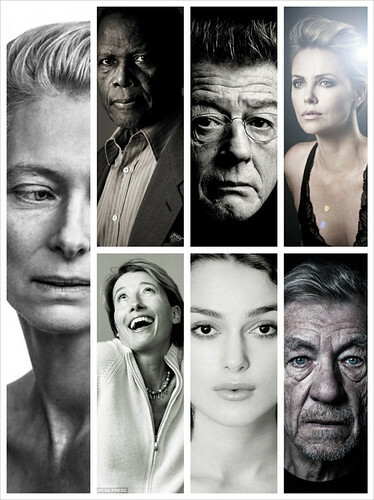 Andy Gotts MBE MA is a photographer based in London, England and New York. He is most noted for his black and white portraits of Hollywood actors and singers. 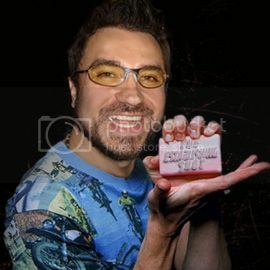 Since 1990 Gotts' work has been published internationally and has appeared in many magazines, including; GQ, Empire, FHM, Total Film, Stern, French Vogue, Glamour, El Mundo, OK Salute!, Marie Claire, io Donna; as well as weekend newspaper supplements and advertising campaigns. 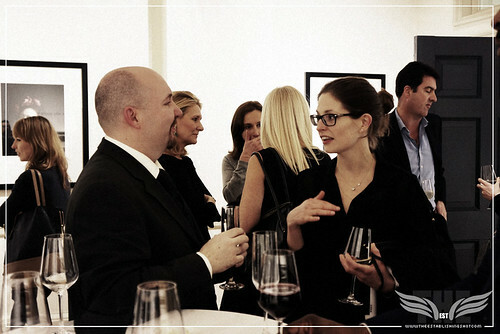 The Establishing Shot: ANDY GOTTS CHATTING WITH FRIENDS - BEHIND THE MASK: ANDY GOTTS MBE PORTRAITS FOR BAFTA EXHIBITION AT SOMERSET HOUSE, a photo by Craig Grobler on Flickr. 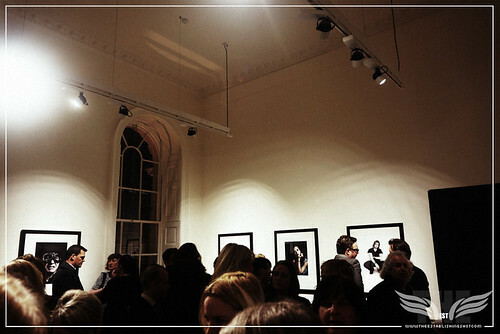 The National Portrait Gallery holds a selection of his photographs in their permanent collection and in 2009 Gotts was honoured with the presentation of the Fox Talbot Award. 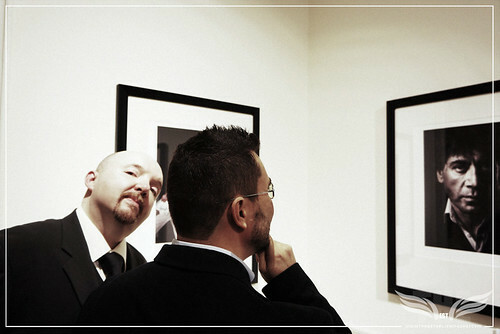 In 2011 Gotts was conferred the degree Doctor of Arts by De Montfort University and he is a former President of the British Institute of Professional Photographers. 2012 saw Gotts appointed MBE in the New Years Honours. Gotts is noted for his magnum opus 'Degrees'. This was a coffee table book and exhibitions inspired by the game, the Six Degrees of Kevin Bacon. 21 January – 7 February 2014. The Behind the Mask exhibition is free to enter and open to the public from 10am to 6pm, daily.